Experience the Love and Magic of Lord Krishna. Dear friends! You can see in comments the issue regarding an Image of Radha Krishna which is a creation of the artist Ms Barnali Bagchi. I am posting this important clarification regarding that image. I had a friend Portia Burton with this blog - http://me-abookworm.blogspot.in/. She was like my sister. Due to the issue about her identity, which didn't seem real, I had to stop communication with her. When we were good friends, as a devotee of Lord Krishna she gifted me the above discussed painting. She told me that this painting is drawn by her friend Barnali Bagchi on Silk. When she gave me the gift, I wanted to show gratitude and immense respect for the artist and the feelings of Portia Burton, so I asked Portia that may I publish this image on my blog. She happily gave me permission. So, I posted it here with my poem to express the gratitude. Please note that, I didn't take this image to make my blog more famous. In fact, this blog is focused on the articles and poems. When I posted the image, I had mentioned the credit to Ms Barnali Bagchi. I have removed this image now. 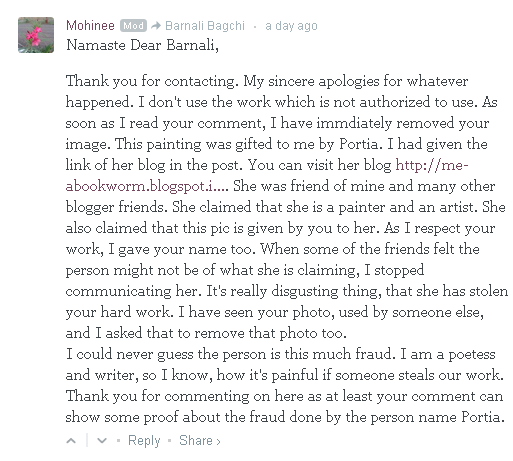 I apologize Ms Barnali for the trouble she had to face in which I became the indirect reason. Now, the question someone may feel, have I done anything Unethical? Portia was good friend of mine. She was an artist, so anybody can believe that any of her artist friend might have given the painting to her. 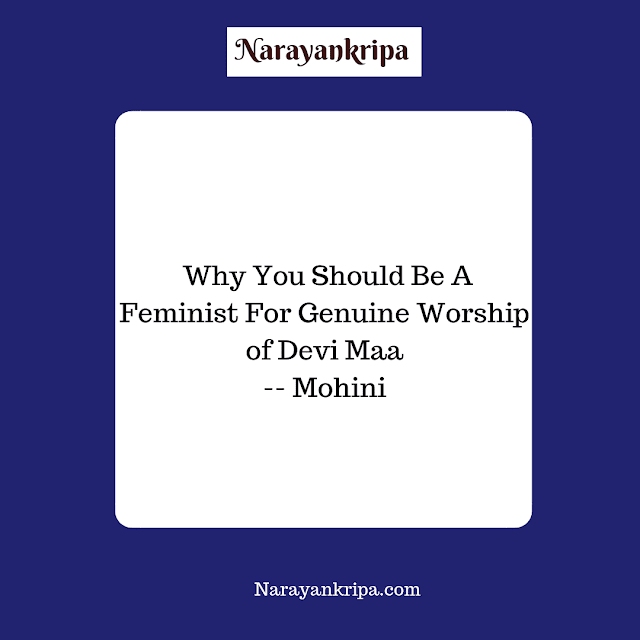 This and many blogs share many posts related to friends, dedicate posts to friends, and show the gratitude too. This blog is not the professional blog. I haven't use the image for any commercial purpose. 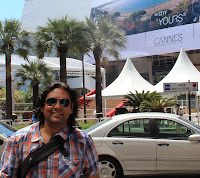 And, I had given the credit to Barnali Bagchi too till it was on my blog. 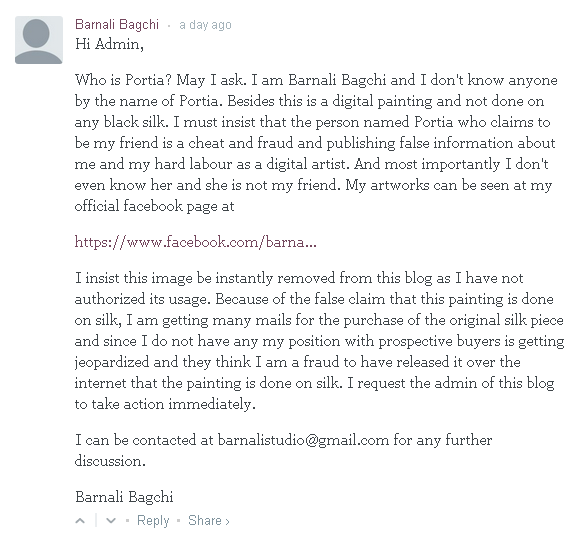 ( Pl Refer comment screenshot by Barnali, she came to know about Portia as I had mentioned about image gift by Portia ). Clearly, I didn't have any intention to earn anything, money, fame or anything from the image. When we are friend with someone, we trust them. This trust cause such mistakes. The lesson from this experience for me is before making friends or any relation we should be very careful. 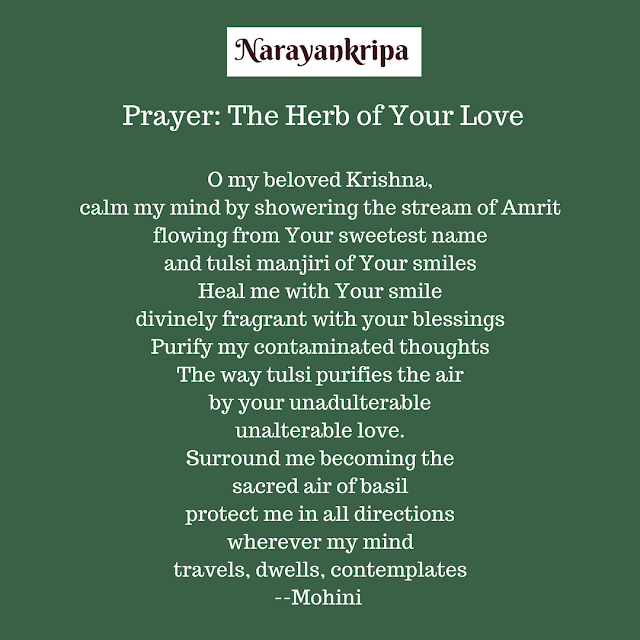 Only the soul who has become one with HIM can write such poem. This is not a poem. IT IS A SACRED HYMN TO BE CHANTED EVERY DAY! I feel so please after reading your poems ! So pure and beautiful feelings reflects your innocent heart through your words! Very beautiful Mohinee.. The artist is very talented.. Thanks for giving us the link.. I will explore the artist blog soon..
Divine art, beautiful words.. together they are creating Magic! I insist this image be instantly removed from this blog as I have not authorized its usage. Because of the false claim that this painting is done on silk, I am getting many mails for the purchase of the original silk piece and since I do not have any my position with prospective buyers is getting jeopardized and they think I am a fraud to have released it over the internet that the painting is done on silk. I request the admin of this blog to take action immediately. I can be contacted at barnalistudio@gmail.com for any further discussion. Thank you for contacting. My sincere apologies for whatever happened. I don't use the work which is not authorized to use. As soon as I read your comment, I have immdiately removed your image. This painting was gifted to me by Portia. I had given the link of her blog in the post. You can visit her blog http://me-abookworm.blogspot.in/. She was friend of mine and many other blogger friends. She claimed that she is a painter and an artist. She also claimed that this pic is given by you to her. As I respect your work, I gave your name too. When some of the friends felt the person might not be of what she is claiming, I stopped communicating her. It's really disgusting thing, that she has stolen your hard work. I have seen your photo, used by someone else, and I asked that to remove that photo too. I could never guess the person is this much fraud. I am a poetess and writer, so I know, how it's painful if someone steals our work. Thank you for commenting on here as at least your comment can show some proof about the fraud done by the person name Portia. Thanks for sorting out the issue. Much grateful!